Phil Mickelson won the tournament that no one (even himself) thought he could win, in 2013. Lefty’s victory at the British Open was huge on several levels. First, it took away the pain of losing the U.S. Open and recording a sixth runner-up finish at the event. 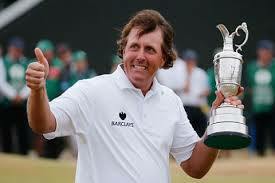 Second, it brought Mickelson back to the forefront of the conversation as a champion rather than bridesmaid in Majors. This entry was posted in Opinion and tagged 2014 pga tour season, phil mickelson on December 30, 2013 by Bryan. We’ve still got a bit of time until the 2014 portion of the new PGA Tour season gets underway. For this purpose, the focus will be on the No.1 player in the world Tiger Woods, and making a couple of predictions on where the direction of his season might go. This entry was posted in Opinion and tagged 2014 major championships, 2014 pga tour season, tiger woods on December 26, 2013 by Bryan. All of the tournaments for the 2013 season (both PGA and non-sanctioned events) have been completed. This past week saw the Franklin Templeton Shootout team competition in Naples, Florida take place – won by Matt Kuchar and Harris English. This entry was posted in Opinion and tagged 2014 pga tour season, tiger woods on December 16, 2013 by Bryan. We’ve all heard that expression before, and never is there an arena that the phrase holds true than in sport. 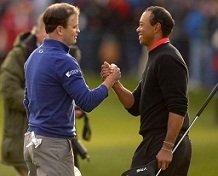 The 2013 Northwestern Mutual World Challenge gave us one of the most remarkable finishes that we’ve seen in some time. This entry was posted in News, Opinion and tagged 2013 northwestern mutual world challenge, 2014 pga tour season, tiger woods, zach johnson on December 9, 2013 by Bryan.